Model shares exclusive look behind the scenes of wedding to Snapchat founder Evan Speigel. 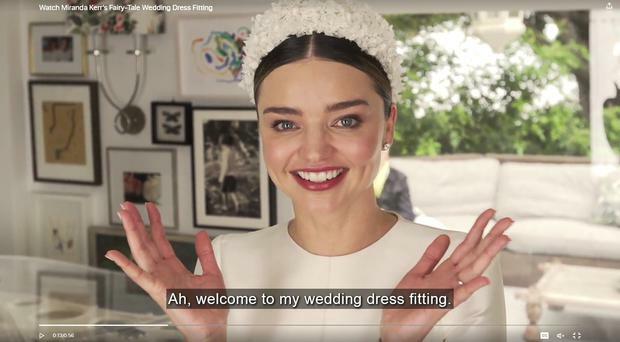 Model Miranda Kerr, who married fiancé Evan Speigel in a lavish ceremony at the couple's California home in May this year, gave fans an insight into her glamorous day with a behind-the-scenes video of one of her ultra luxe wedding dress fittings. The 34-year-old, who was previously married to actor Orlando Bloom, beamed in an elegant princess style Christian Dior Haute Couture gown and pretty white floral crown as she took fashion followers 'backstage' ahead of her glamorous big day. The wedding dress, a long sleeved A-line satin gown with a high neckline, buttoned-down back and 3d floral embellishments, was created by Dior designer Maria Grazia Chiuri, and inspired by the iconic Grace Kelly. "Grace Kelly was a real inspiration with her dress, and how timeless it is," the now newlywed revealed in the dreamy video. "I had two fittings and it all just came together so magically and so beautifully." The couple's wedding day was wholly intimate affair. Around 45 close friends and family were invited to their Californian home to celebrate in a relaxed and 'cosy' setting. According to Vogue the bride even made her partner's favourite meal (slow-roasted chicken scented with turmeric and lemon!) just for him that morning, while a caterer replicated the dish for the rest of the guests. The former Victoria's Secret Angel revealed last month that prior to walking down the aisle she enjoyed a daily dose of yoga. Speaking on a panel with lifestyle blogger and actress Gwyneth Paltrow at at GOOP event in California, Miranda said she practised some of her poses just before family and friends arrived for her nuptials. "Our wedding was just so joyful," she recalled, according to People. "We started the day, did yoga, then our families came over and we literally had this celebration in our backyard. It was incredible. It was so magical."